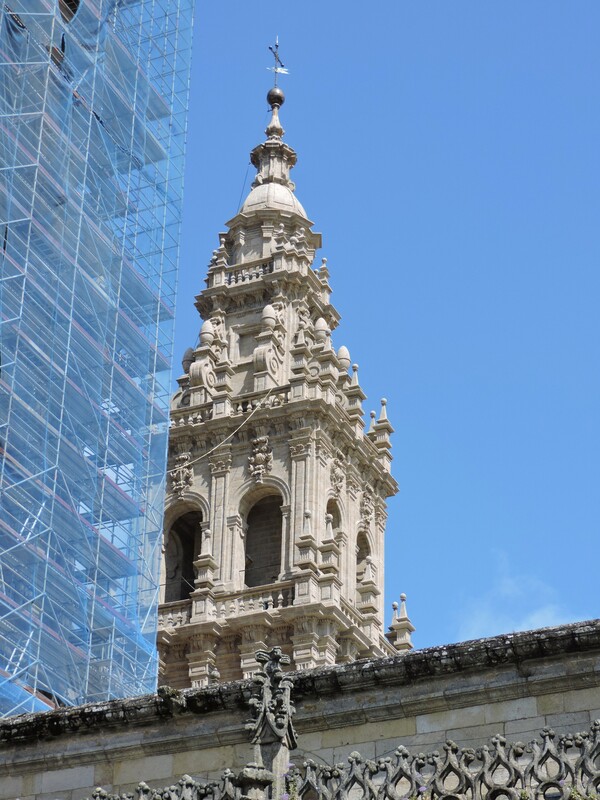 The train station in A Coruña looks like a cathedral. Or seems to as we’re being driven towards it by our nice, helpful taxi driver. Inside the cavernous building, two men on the track are washing a waiting train – not ours, which seems clean enough when it arrives. 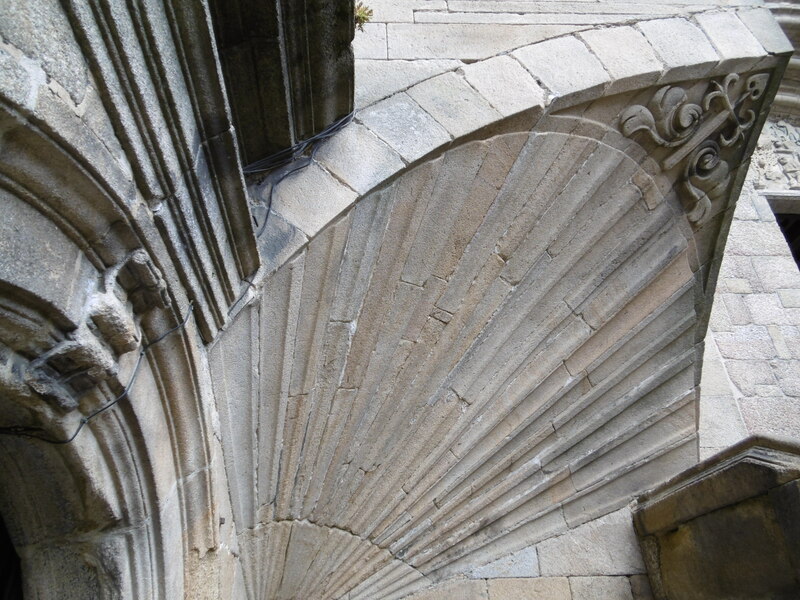 All goes like clockwork and less than an hour later we’re there – Santiago de Compostela. The guide book suggests we could walk to our hotel but we opt for our third (so far) pleasant, helpful, taxi driver’s assistance and arrive at our destination grateful and gawping. The outside’s impressive – but the inside is almost unbelievable. 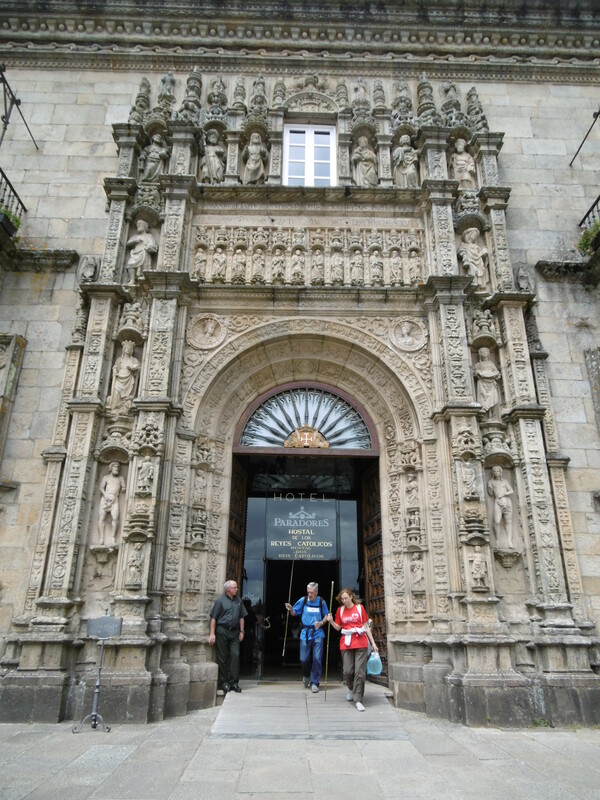 The Hostal Dos Reis Católicos, now a Parador hotel, was built in 1499 to give shelter and aid to pilgrims. The way was hard. 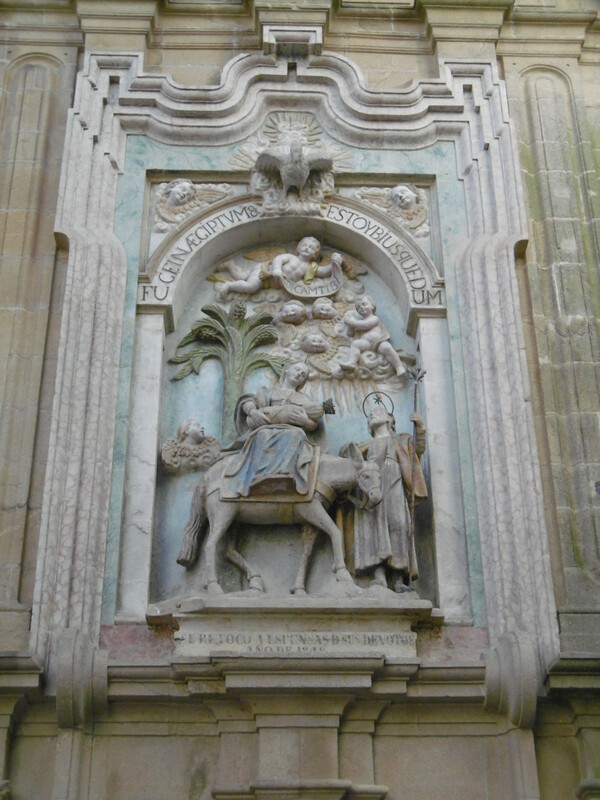 On the long and arduous camino, pilgrims were often beset by vagabonds or fell prey to sickness. The hotel’s own guide to its history is told through wall-mounted 79 plaques and – I’ll be honest – we fail to make it around them all, or even most of them – during our two night stay. 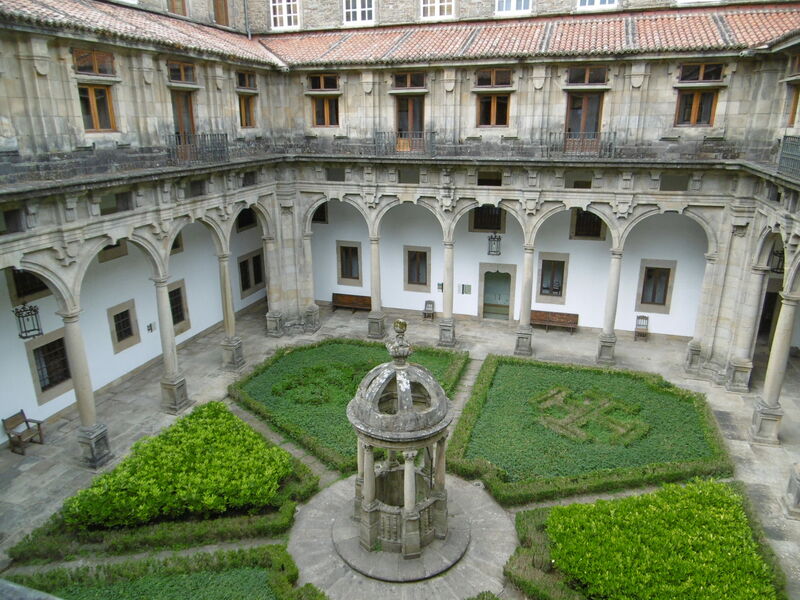 The building itself is arranged around four beautiful courtyards, named after the gospel Saints – Matthew, Mark, Luke and John. 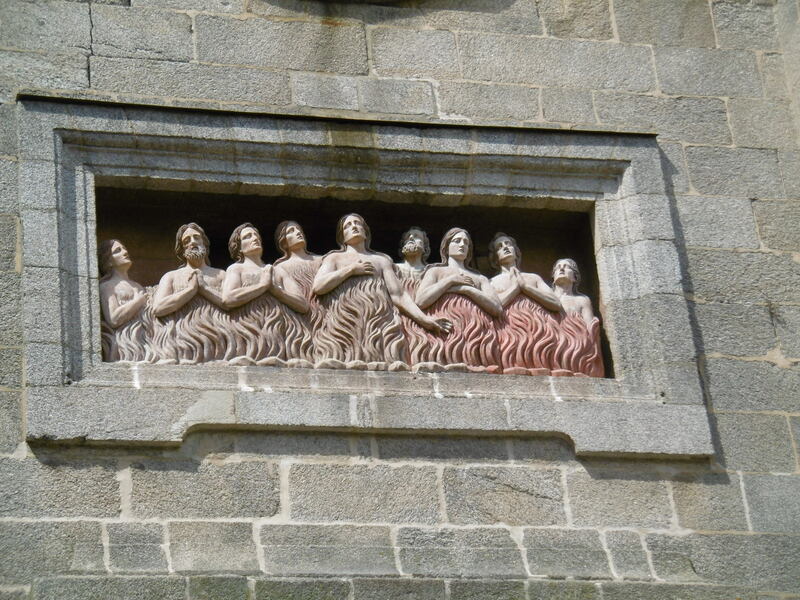 Gargoyles squint down at the earth, like dire warnings of the ugliness resulting from sin. 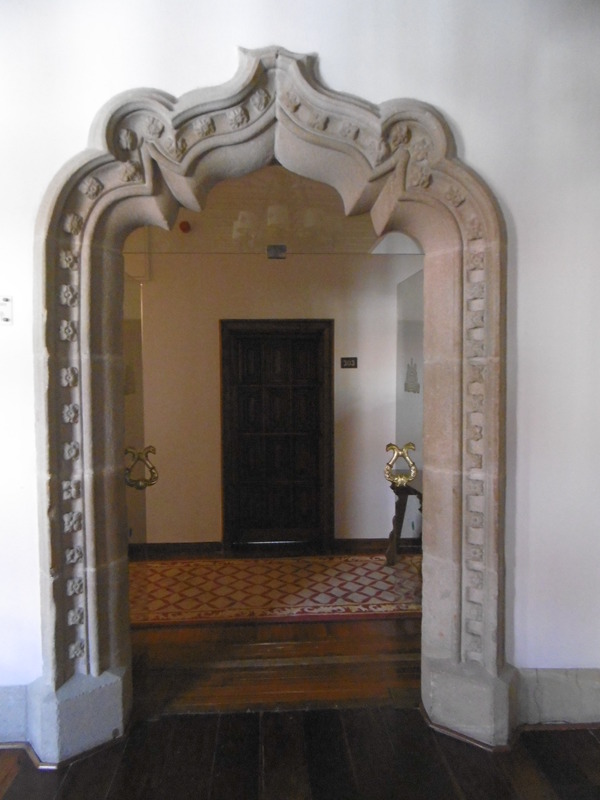 The Hostal had its own medicinal gardens and two of the courtyards now boast lush, green knot-style gardens that guests can wander around or look down on from the corridors above through a plethora of windows. 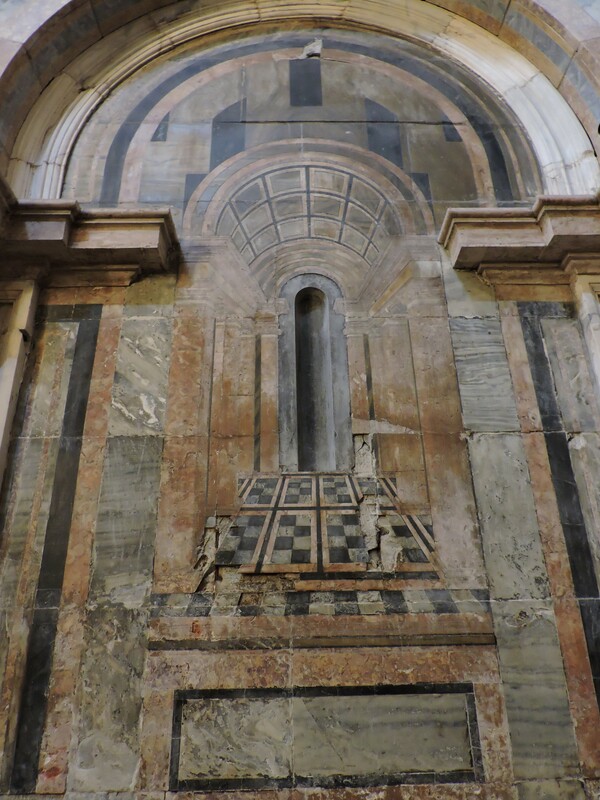 There was a window with a bell and revolving compartment like those in cloistered convents. A person would ring, wait to hear Ave Maria Gratia Plena and then leave the newborn. How cold it seems to us with our modern sensitivities. But also, somehow, reassuring. 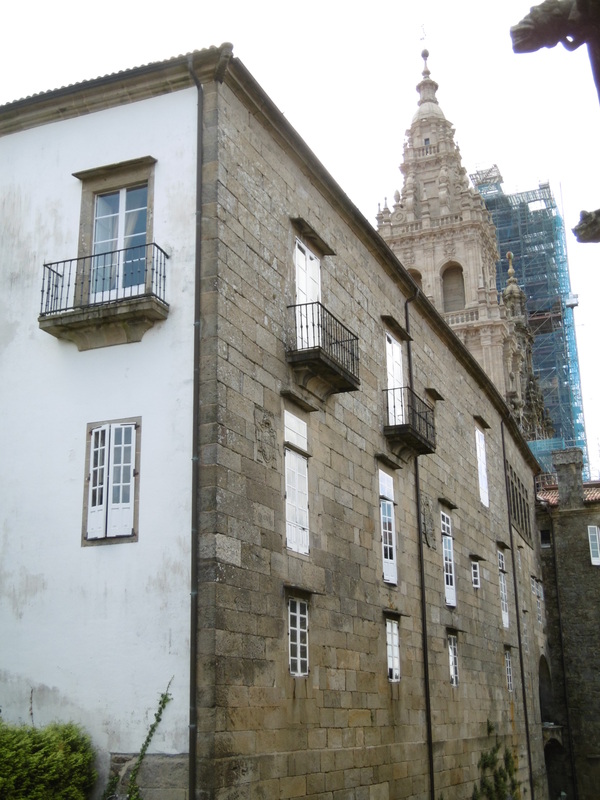 The hotel occupies one side of the square whose focus is the cathedral. Leaning out of our room’s window, turning away from the second largest monastery in Spain which rises opposite us, we can see the towers of the cathedral. One is shrouded in scaffolding – but it fails to mar the experience. Does it live up to my expectations? No. It exceeds them, but not in the way I expected. 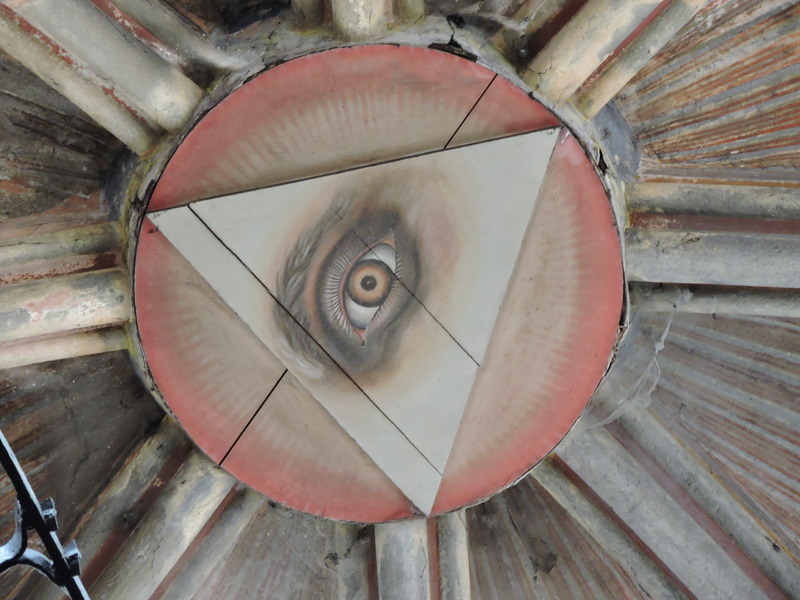 I always hope, when visiting places that have special spiritual significance in the world, for whichever religion – or none, that I’ll feel the essence of that spirituality myself. Share in it. Sometimes – visiting Lindisfarne, for example – I leave disappointed. 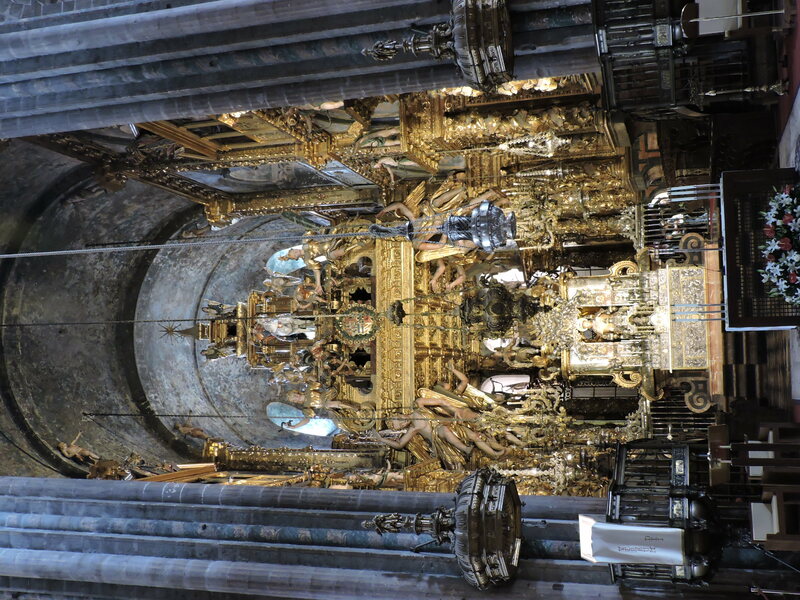 The cathedral in Santiago de Compostela is vibrant with gold, with saints, with carvings, with paintings. It oozes history and fervour and hopes and dreams. 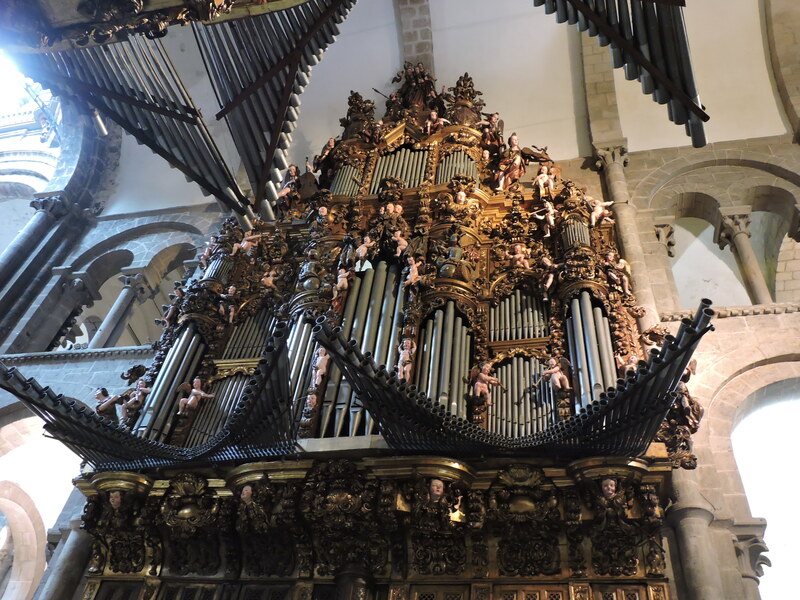 One of the most ornate organs ever surely? 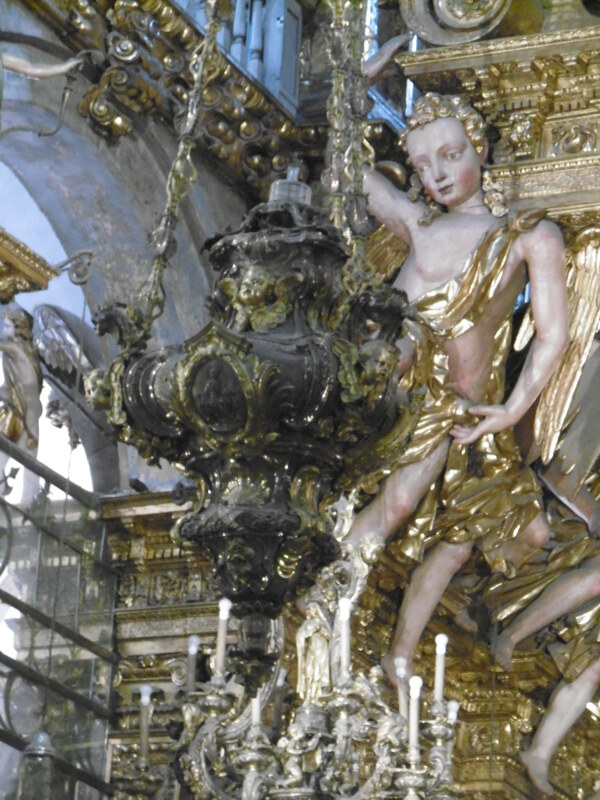 Look at all those cherubs! But, it’s not the building that works its magic on me. Next day, we’re standing overlooking the square from the cathedral museum’s terraces when a large group of young people arrives, rucksacks on backs, staffs in hand, their pilgrimage complete . A cheer arises from them – and many of those standing around the square share their celebratory joyfulness. This happens again and again in large and small clusters. Some individuals arrive and you can see on their faces just how much it means. Motivations are no doubt many and varied, but it’s clear that everyone who undertakes el camino seeks something. Some spiritual or personal goal has driven them on. No-one looks disappointed. 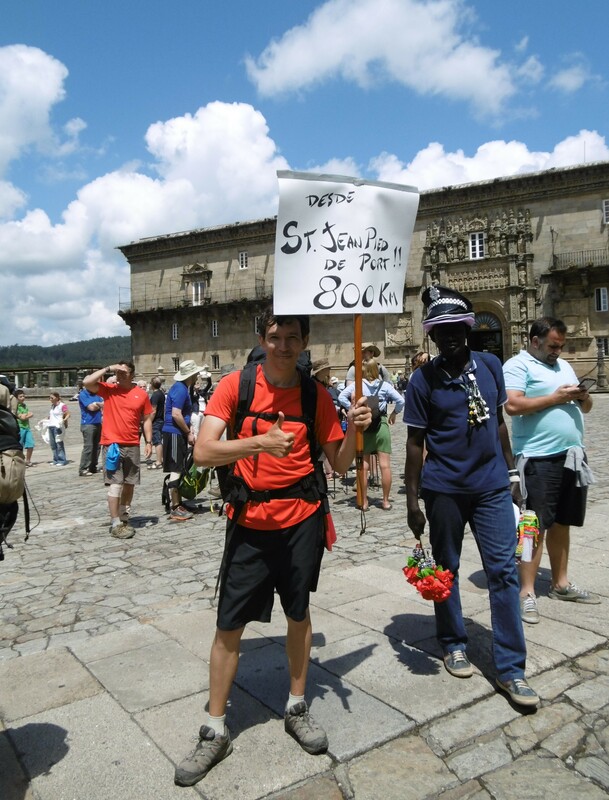 Along with the many genuine pilgrims there are plenty of tourists – like us – who haven’t walked the camino. But it feels as if everyone is here for more than just the buildings – or the souvenirs. The town seems not to have wearied of its nature as a destination. It doesn’t exude the cynicism so common to major tourist destinations. Local people don’t seem to have that blasé, seen it all indifference. The cathedral, unlike some of our beautiful British cathedrals (shame on you Ely) doesn’t charge the hordes for admittance. 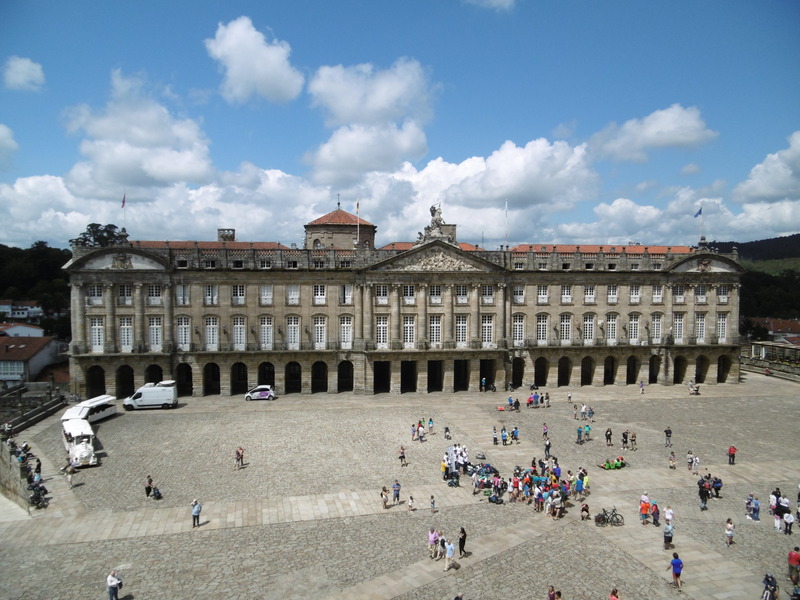 Prices are not much higher than those we found in A Coruña. It’s a place with a heart and soul, despite the regular influx of visitors. Pictures don’t do the place justice. Or at least, mine certainly don’t. I’ve mixed in a few taken by my fellow traveller’s bigger and better contraption to help improve the offering. 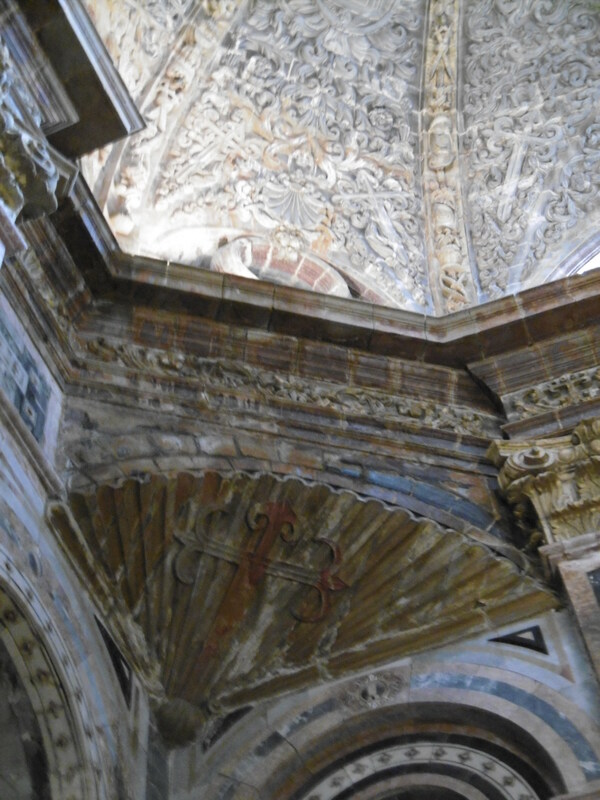 And it was a great disappointment to me to discover that my favourite visit, to a monastery, left me with even poorer pictures than usual of a moving and wonderful place. But that’s also a lesson. I can still feel its sanctity. And that is, after all, what matters. Second largest monastery in Spain? But it’s not all about churches and buildings and pilgrims and shops and history. As you might expect, we also eat while we’re here. 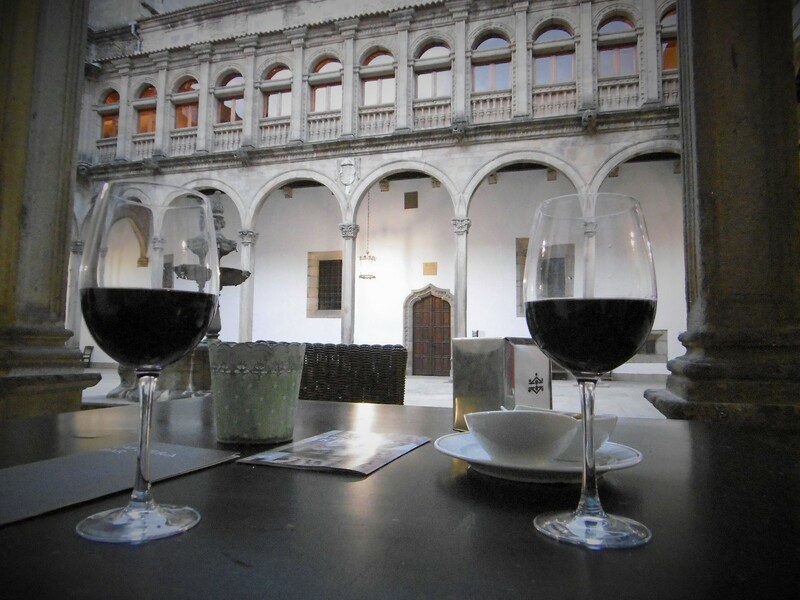 The food is wonderful and so is the wine – more local, tasty, red and white, drunk in some amazing settings. We find a beautiful, tranquil bar in a leafy garden behind a cobbled street, drink a beer to the sound of a fountain, amid sculptures and magnolia trees. I buy a tiny silver cross to add to my charm bracelet and am bought a gorgeous silver and jet necklace – this is my official birthday trip, after all. Postponed from last December. And I’m being spoilt, again. 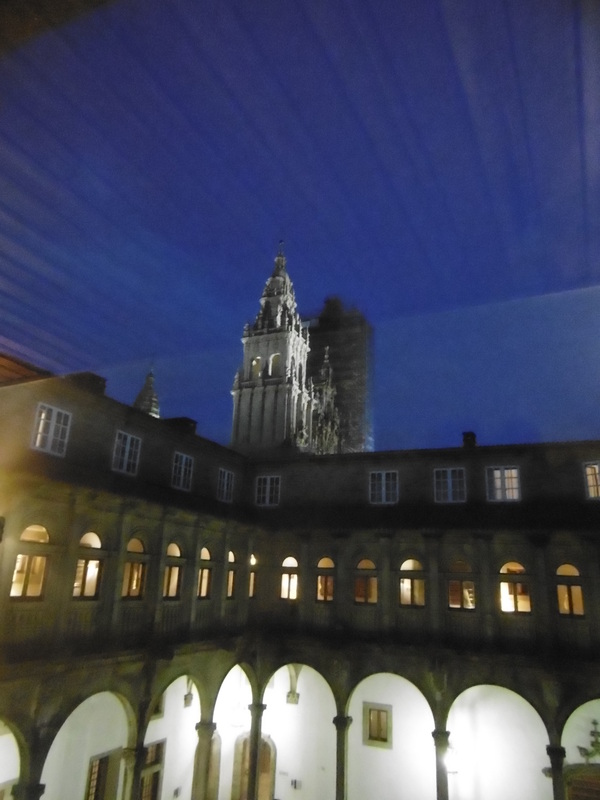 I’ll leave Santiago de Compostela, Saint James’ field of stars – and dreams – just there. My dream has come true. And I would gladly return. 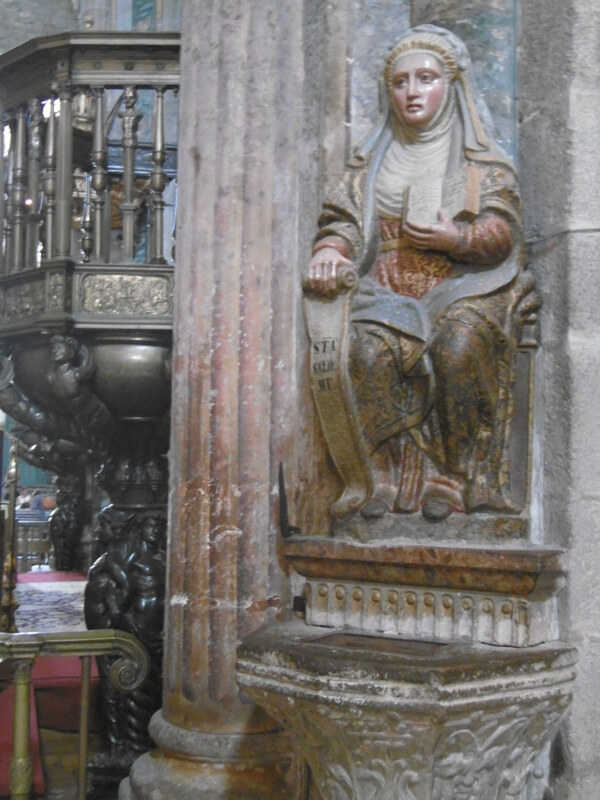 In fact, I have a notion to walk the other route, from Portugal. Over many, many days, in manageable chunks. We’ll see. 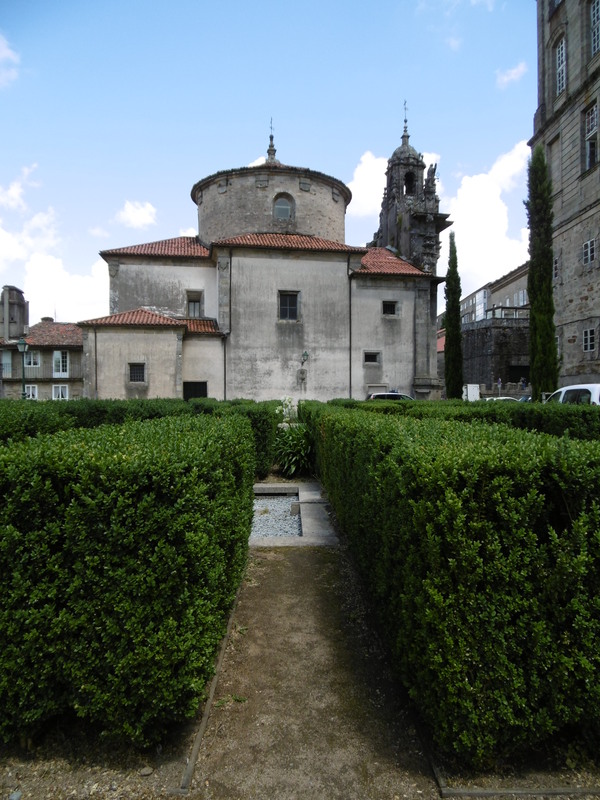 Meanwhile, after two nights in the museum, with much left unaccomplished, we depart on another train, for one night in another Parador, in Pontevedra. How can it live up to this? 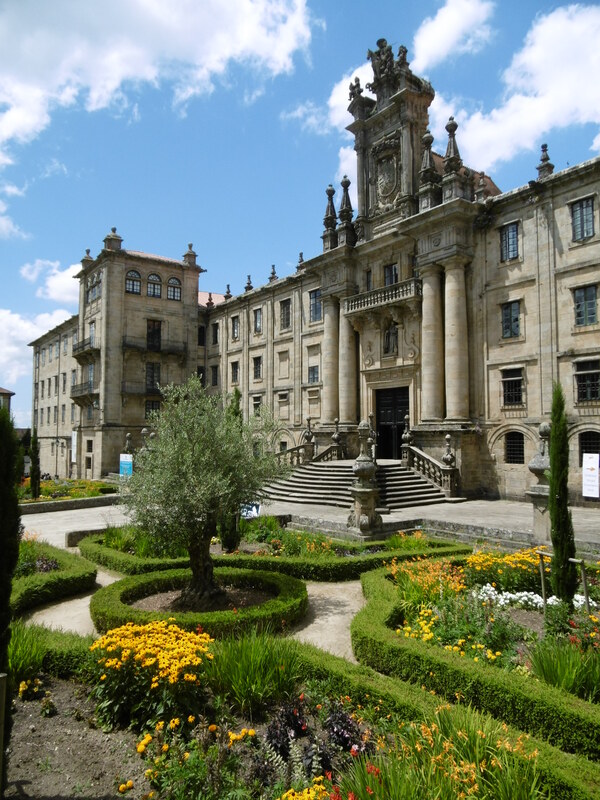 Well, it can’t – but a monastery there will go straight to both our hearts – and one cake … well, more of that in the next instalment of our own little, touristic, camino. 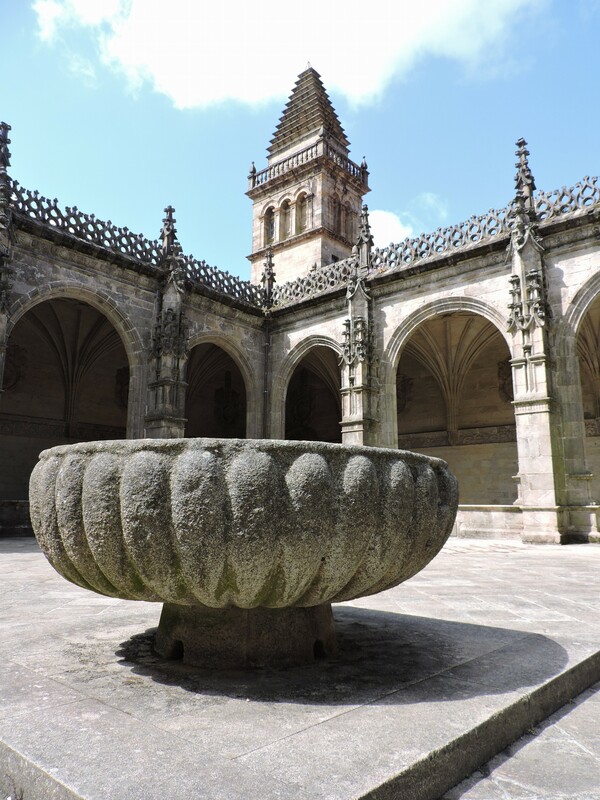 This entry was posted in Travelling and tagged el camino, Field of Stars, Galicia, Hostal Dos Reis Católicos, Mencia wine, Parador, pilgrims, Santiago de Compostela, scallop shell, Spain, St James. Bookmark the permalink. Although it’s not possible to revisit past days, your recollection suggests that it’s possible to visit past places. I imagine from viewing the lovely photos that it would have been possible to set aside some sense of reality and feel transported back to earlier times. It’s just stunning. How wonderful you got to stay there. It was very – overused word I know – special. And, yes, despite the hubbub, possible to step back in time. Genuinely the first really tourist-inundated place I’ve been where it didn’t feel touristy, if you see what I mean. That feeling there was a reason for being there. 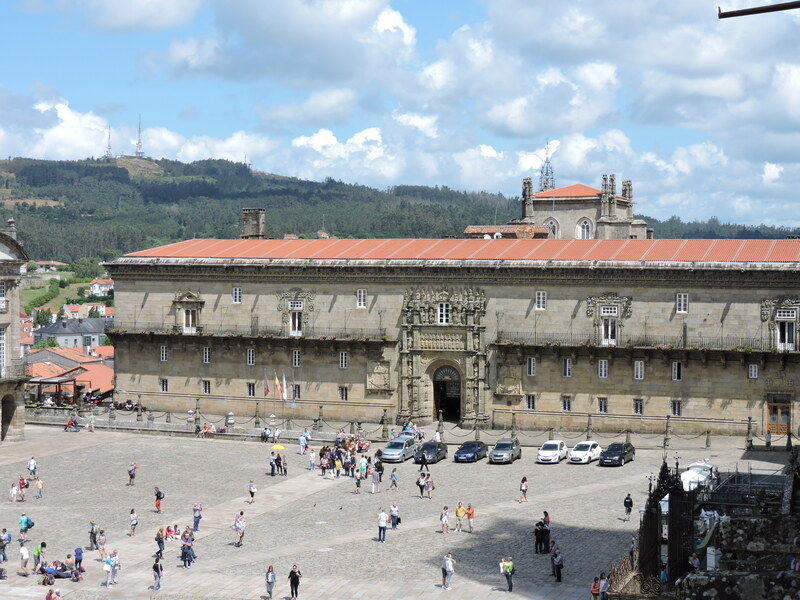 We were lucky the company that organised our train journey got such good rates at the Parador. And so on to the next … more food coming up! 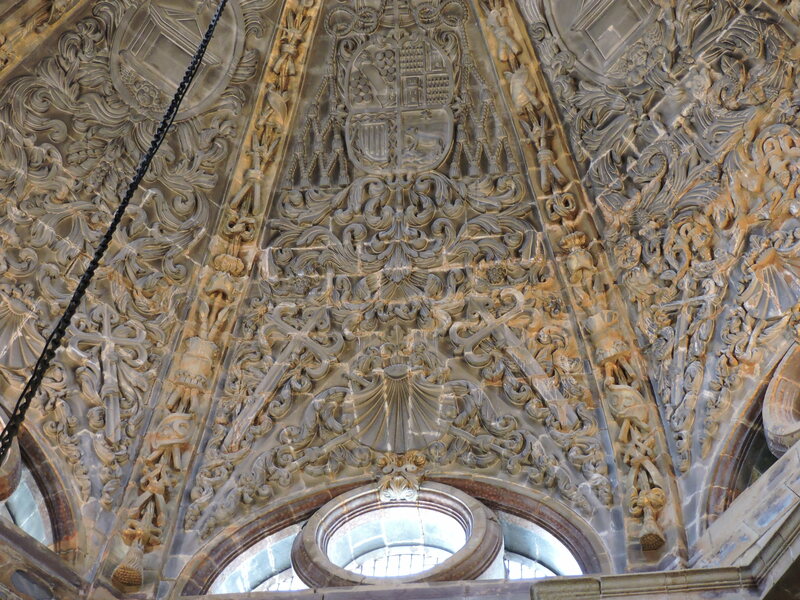 I am gushing with so many superlatives right now that if I wrote them all down I would sound like a crazy person — you know, the kind from which one might seek refuge inside the Hostal Dos Reis Católicos. This may be my favorite account yet of an arrival at Santiago. Beautiful photos, and your writing is as superb as ever! Thank you for taking us along. Thanks Heide, you are kind and very welcome! I know exactly what you mean. 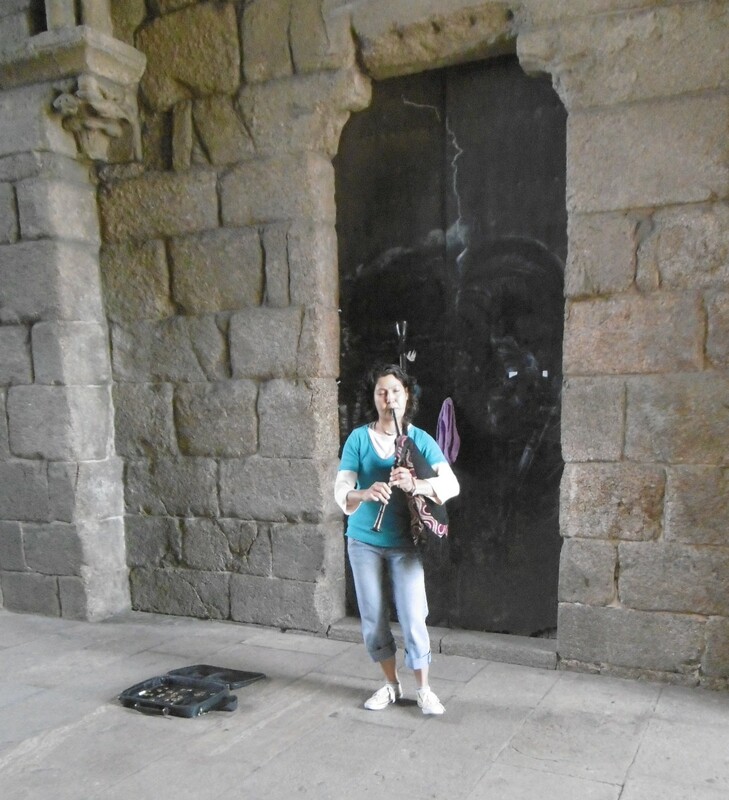 Despite all the people – or in fact, perhaps because of them and the reasons they were there – it felt very different from any other ‘tourist’ destination that I have been that was similarly busy. In an ideal world I would walk back there… In fact there’s a route from Portugal in the south which sounds quite interesting. So glad you enjoyed it, always a bit nervous about recommending my own posts. The way you described it in your post was so perfect — I could imagine the jubilation of seeing Compostela after a long journey, but also the sense of reverence after contemplating the meaning of the journey for so many weeks. It is a very unusual and rather wonderful place – I don’t think you’d be disappointed. 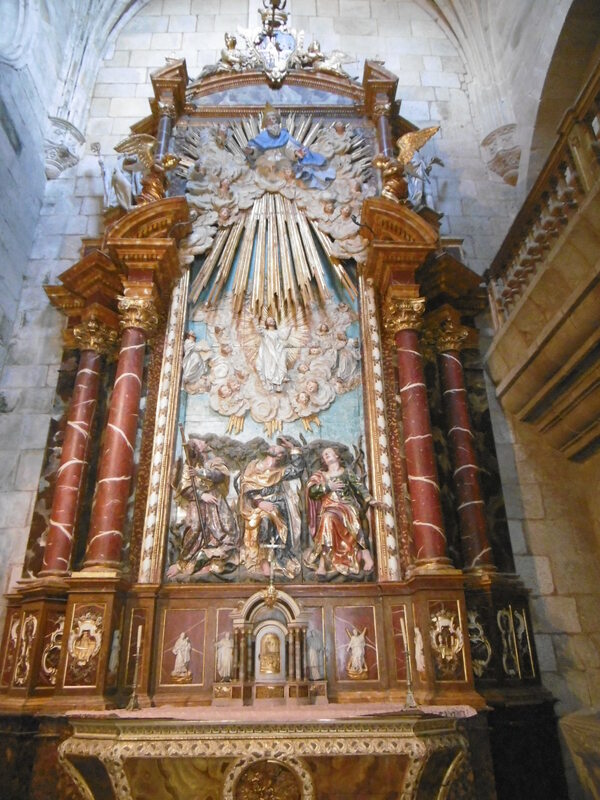 That book I recommended, by the way, is written by someone who was a Catholic and I think wanted to find it was her salvation again – so you might find it too religiously oriented – but it might be worth consulting it just for the fascinating places to visit. And thank you so much, again, in a lonely, wearing week you’ve made me feel great!